I think everyone has someone in life they want to prove wrong. Personally, mine is one of my Year 10 teachers from school. He once gave me detention and told me I'd end up working in McDonald's or as a car park ticket attendant. All because a guy I knew threw a pencil sharpener at my head and I refused to give it back straight away so he didn't do it again. Good teaching right there. Besides, there's nothing wrong with working in McDonald's nor a car park if that's what you want to do in life. I know this teacher probably doesn't even remember this incident let alone me, but 8 years later whenever I've needed some motivation in education, my job and life in general, I still think of this moment. Prove him wrong and become better than the rubbish teacher he was in the process. Don't let those negative moments in life get to you. Turn them into a positive and use them as a motivation to achieve whatever it is you want to achieve. 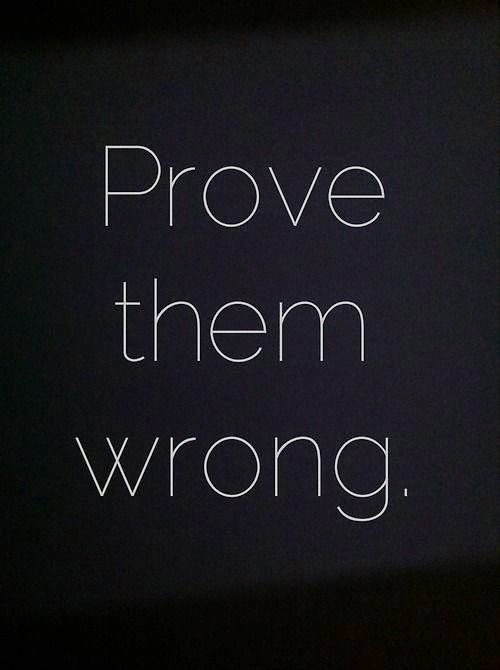 Prove them wrong, you can do it.